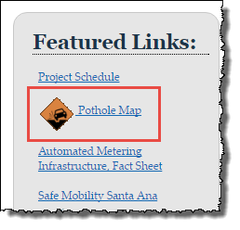 SANTA ANA – The City of Santa Ana recently launched the Santa Ana Maintenance System pothole map—an online data tool that is linked to the mySantaAna app, a smartphone-enabled reporting tool for maintenance service requests. The user-friendly map displays all reported potholes, including their location, date reported, status, and date filled. “The Santa Ana Maintenance System pothole map allows residents to easily see where potholes are and to track how soon they are being repaired,” said Mayor Pro Tem Michele Martinez. “By using data to map out potholes, we are able to better communicate to residents, repair potholes quickly, and ensure safer and more efficient travel on our streets,” she added. “The purpose of this map is to inform residents where the City is filling and repairing potholes on our streets,” said Fred Mousavipour, Executive Director of the Public Works Agency. “As an additional tool, we can also use this data to make better decisions regarding the use of resources in street maintenance operations,” he added. Available for free download on the Google Play Store and the Apple Store, the mySantaAna app enables users to actively report potholes and other maintenance issues. The mySantaAna app uses GPS information included in each maintenance request to automatically update the address and location of reported maintenance issues. For more information on the mySantaAna app, visit www.santa-ana.org/apps/mysantaana/. The Santa Ana Maintenance System pothole map can be found on the Public Works Agency’s home page: www.santa-ana.org/pwa/.